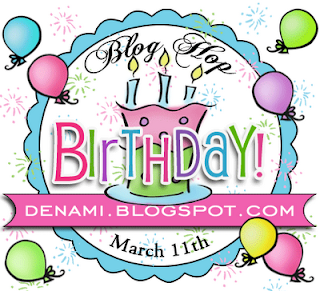 Welcome to DeNami's March Blog Hop! 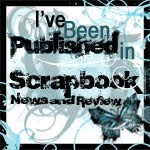 If you are following the blog hop, you must have come from Mirta Sanchez's wonderful blog! If you missed the previous blog stops, you can hop back over to the DeNami Blog to start from the beginning. 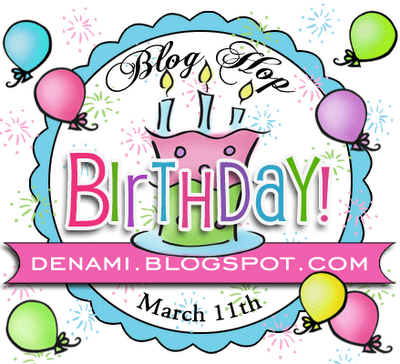 You have until March 12th, 2012, 11:59pm PST to leave comments on all the blogs in order to be eligible to receive one of the two $20 DeNami gift certificates. Winners will be chosen randomly. Good luck! For this month's project, I chose the cute little Chickie cupcake cling stamp. I stamped the image on a scalloped chipboard and coloured it. Then I layered it with a few more 'yummy' patterned papers for a cheerful birthday card. It isn't summer yet, but I'm dreaming of some summer fruits and desserts already! Thanks for looking! Next stop is the talented Wendy Elliot's blog. I LOVE this stamp from the new release, and you showcased it perfectly. Excellent choice in patterned papers -- very sweet card :). I love the hexagons & the colors are vibrant. This is really sweet! I love that darling little chickie! Have a great day! Thanks for sharing! Too cute...love the rich colors. What a precious card. Love the little chick. Great colors. I have, and love, this paper. Thanks for sharing. Oh how cute, I do love those DeNami chickies! This new chickie is going on the must-have list! sweet card! I'm with you come on summer! this card is cheerful and bright. thanks for sharing. Those chicks are so cute and you've added lots of great color! So cute and I love the border you created with the pearls. Love that new cupcake chickie! What a pretty card! Very cute card. Love the paper and the bright colors. I am really loving the chickie in the cupcake stamp, so sweet! This card says it all.....sweet!!! Awww what a cute card! Sweet card, for sure! Love that new cupcake chickie, and your design is perfect for it. Great colors for this fun card, too!! What a sweet card and does remind me of fresh fruit! Cute card! The bold colors are great! Love the colors you used! Super happy and the chickie is so cute!! Love the fun bright colors of your card. They make the chickie look so happy! Shirley, this card is awesome! Don't you just love that Cupcake Chickie? He has a knack for bringing a smile to peoples faces. 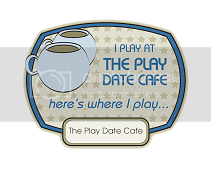 :) Glad you were able to join us for the blog hop! Sweet as can be, Shirley!!! LOVE that ADORABLE cupcake chickie and your choice of patterned papers!!! !